What does perseverance look like for those who follow Jesus? The process is not finished but it is going on. Delightful. Encouraging. Big ideas- 1. You can build courage 30 days at a time. 2) Small, sustainable changes stick. Watch this talk! It took 6 years of failure before Elizabeth Gilbert was finally published. Why did she continue to put herself through that pain? “I loved writing more than I hated failing at writing. Which is to say I loved writing more than I loved my own ego. Which is ultimately to say I loved writing more than myself.” Writing is her home. She returns to it again and again in failure or success. “I will always be safe from the random hurricanes of outcome as long as I never forget where I rightfully live.” What is your home? “Ideas are the most powerful force shaping human culture.” Ideas shape us and change us now. We carry this change into future attitudes and behaviors. 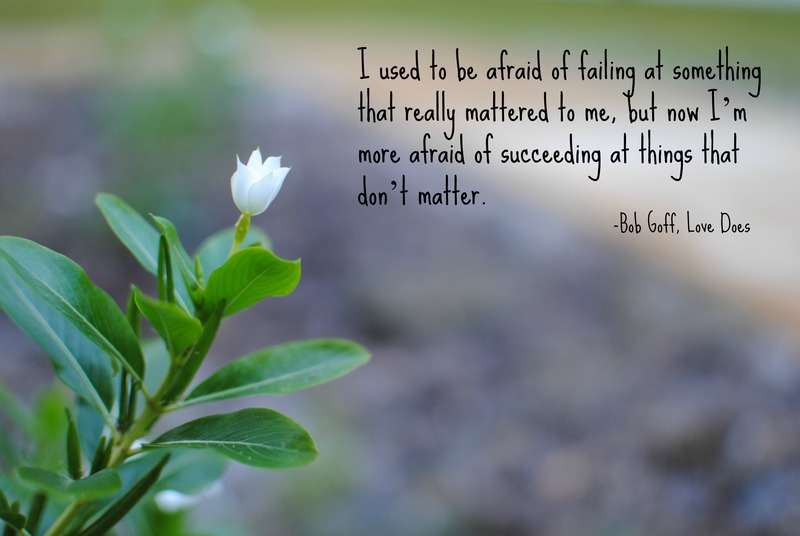 I used to be afraid of failing at something that really mattered to me, but now I am more afraid of succeeding at things that don’t matter. Usually, without growth being forced on us, few of us go willingly on the spiritual journey. Why would we? The rug has to be pulled out from beneath our game, so we redefine what balance really is. More than anything else, this falling/rising cycle is what moves us into the second half of our own lives. There is a necessary suffering to human life, and if we avoid its cycles we remain immature forever. It can take the form of failed relationships, facing our own shadow self, conflicts and contradictions, disappointments, moral lapses, or depression in any number of forms. We err when we think that we can have a “sliding scale” of accomplishment in the rest of our lives, but must have a “perfect score” when it comes to discernment. Instead, we must understand that finding and following God’s will inevitably brings us to moments when we realize we have failed to “get it right.” It’s in that moment we must understand that discernment is not about complete accuracy, but rather about complete devotion. Success is liking yourself, liking what you do and liking how you do it. it all becomes rich, black soil. We 21st-century types want our lives to be full of successes and significance. We want our children to be impressive to the world around us. Jesus calls on us to have more patience with and respect for failure, hiddenness, and insignificance. In the process of gaining our rightful place, we must not be guilty of wrongful deeds. Let us not seek to satisfy our thirst for freedom by drinking from the cup of bitterness and hatred. We must forever conduct our struggle on the high plane of dignity and discipline. – Martin Luther King, Jr.
“O Lord, let your ear be attentive to the prayer of this your servant and to the prayer of your servants who delight in revering your name. Give your servant success today by granting him favor in the presence of this man.” I was cupbearer to the king. Bearers of the cup of salvation from you, our King, to a thirsty world. Forgive us, for we often twist and waste your gifts and empowerment. that we may rise above falsehood and selfishness. that we may share every ounce of your blessing with joy and thankfulness. for the honor and glory of you alone. Amen. You are welcome to use this work in a worship setting with proper attribution. Contact Lisa for posting and publication considerations.